Accurate Tree Service was born when David J. Burl of Dunbarton NH transitioned from doing large scale tree removal on a commercial level with his family business of Burl Land Clearing, to addressing the need in the area for a company to handle the much more delicate and personal aspect of Tree Care. 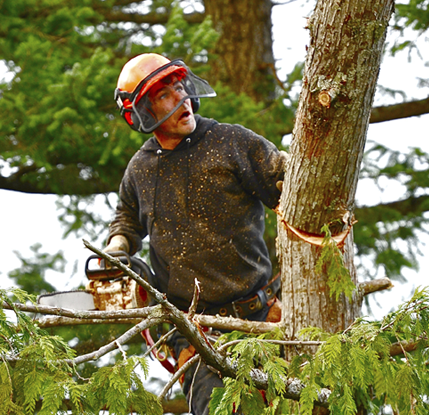 With this introduction of Accurate Tree Service, he would focus on Tree Health Management, Arborist work, Hazardous or Difficult Tree Removal, Tree and Bush Pruning, Cutting for Views, Yard Expansions and Tree Care, while Burl Land Clearing would continue to handle the larger scale logging operations. Although the two companies operate completely separately, it offers the market, a well rounded, multi-faceted, tree company capable of handling any size job. With the combined resources of Accurate Tree Service and Burl Land Clearing, there is no job too big or too small. Accurate Tree Service prides itself on offering superior results, in a reasonable amount of time, for a competitive price. Our trained and seasoned professionals always have the customer’s best interest in mind and will offer the best options for the tree’s health, and the families’ needs and deesires. We are fully insured and professionally trained and stand by our work. We are not happy unless our customers are completely satisfied, because our customers are our most valuable asset. He has spent his entire life in New Hampshire, working in the tree care industry and has an educational background in Business Management. For more information about us and what we are all about, check out our blog!